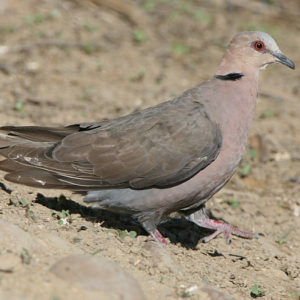 A large dark-collared dove with pink head and narrow dark red eye ring. Call often sounds like ‘I am a red-eyed dove’. Pairs for life. Territorial. seeds, berries, rhizomes, flowers and arthropods. 30 to 33 cm Resident seeds, berries, rhizomes, flowers and arthropods.